A silver bowl of water was set down in the middle of round table inside the Helene G. Simon Hillel Center. Next to the bowl were two pieces of paper stapled together. The event “Challah for Hunger” involves volunteers creating the ceremonial Jewish bread to sell for $5 a loaf. All of the proceeds go to charities at the end of the semester. “There’s actually quite a significant population of students on campus who are hungry, and they go to Hoosier Hills Food Bank for food,” said junior Kathryn Stuff, president of Challah for Hunger at IU. The money is donated to Hoosier Hills and Mazon, an advocacy organization working to end hunger in the United States and Israel. “It gives back directly to the community in a way,” Stuff said. Oil was poured into the bowl of water. The two substances collided and refused to mix. Bubbles formed as the two liquids fought for dominance. Small piles of yeast were dropped into the bowl. They stayed clumped together until a spoon was brought down into the bowl, violently mixing the ingredients. The ingredients began turning into a light brown color. The water, oil and yeast had to sit for 10 minutes. In that time, attendees began to introduce themselves. Some were there for service hours, some because they were part of a service fraternity and others because they were just interested. Sophomore Cooper Weingartner, a member of Alpha Phi Omega, was at the table making jokes with the others and helping make the dough. “It’s one of the most chill places to give back,” he said. Junior Rebecca Tessarolo was sitting across from him at the table. She was there to earn service hours for her class, but she said she ended up having fun. 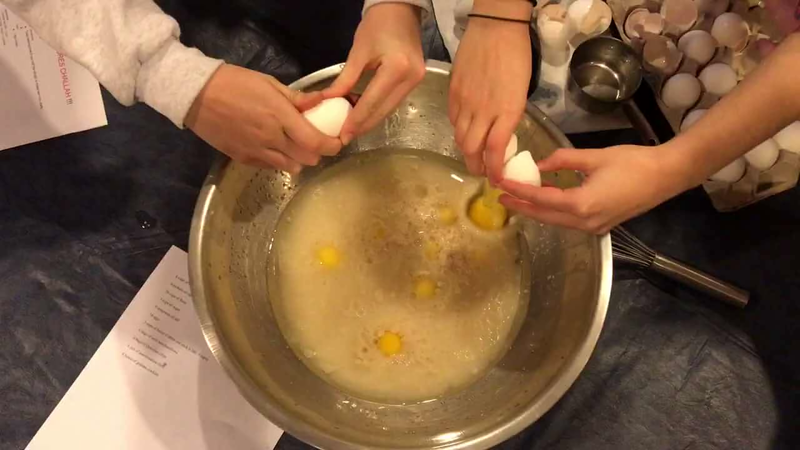 As Papa Roach’s “Scars” played on a small speaker, 12 eggs were cracked by multiple sets of hands above the bowl. The yellow yolk plopped and settled into the thick substance. Then a whisk came down and began to mix them all together. The liquid turned yellow and began to froth. Meanwhile, people were singing along to the music. Two cups of sugar. More mixing. Then the flour, 24 cups to be exact. The dough would have to be mixed, but the plastic spoon was too weak. After rolling their sleeves to just below their elbows, several people began to knead the dough with their hands. They stuck to the stringy, sticky dough. It got between the fingers, but eventually the dough began to solidify. “Baking for me is a big stress reliever,” Stuff said. Other people continued flipping the dough over and over and pressing it in with the soles of their hands. After it was solid enough to remove as a whole, the dough was set on very thin paper to be continuously kneaded. The bowl was passed around the table far more times than it needed to be because each person wanted to have a hand in kneading it. Finally, the last person pressed his hand into the dough and carried it, inside the bowl, to let the dough rise for 30 minutes before the volunteers would bring it out once more to braid into the shape of challah bread. While the bread was back in the kitchen rising, the volunteers wiped the excess flower and dough off their tables with wet paper towels and began to sing along to the music again, talk and laugh with each other until the braiding began.